On just about every street you’ll find trees in bloom, shrubs bursting with color and window boxes filled with fragrant flowers. You can see these beautiful blooms – and many more – by simply walking the Battery, the streets South of Broad and in many of Charleston’s parks. Azaleas: You might not give these shrubs a second look most times of the year, but in the spring, they will get your attention when they sprout forth with blooms of hot pink, red and white. You’ll spot them in yards, gardens and parks all over town. Wisteria: A high-climbing, trailing vine, wisteria can grow up to 70 feet long. In the spring, it drips clumps of lilac blooms in a showy display of springtime beauty. Wisteria is an invasive plant because its dense growth can choke out trees and other plants. Jasmine: This plant’s intoxicating scent is a true signal spring has arrived. Confederate jasmine is commonly found here in coastal South Carolina and its fragrant clusters of white and yellow flowers bloom on twining stems in spring and into the summer. 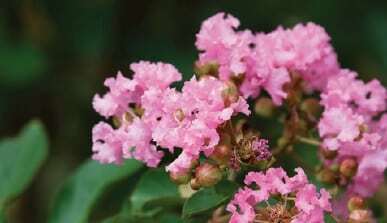 Crepe Myrtle: With its arching branches and flowers of bright pink, red and white, this tree is a Southern staple. Charleston is also home to the Noisette rose, a hardy rose that can withstand a hot Southern summer and cool winter temperatures. These roses also have a high resistance to disease. But what’s truly special about this rose is its history and tie to Charleston. According to the Charleston Horticultural Society, John Champneys of Charleston crossed a rose commonly called “Old Blush” with another variety called Rosa Moschata to create Champneys’ Pink Cluster, America’s first hybridized rose. Champneys gifted the rose to his friend Philippe Noisette, a French botanist, who refined the hybrid to create the Blush Noisette with delicate blooms and pastel colors.